Ed Note: The author was a mother with a newly-adopted greyhound, a husband, a 4-year-old daughter and 7-year-old son. The dog was almost returned because she had nipped the younger child in the face. Jo looked for some information on how to handle it and came up with these suggestions. The article was written in the mid-1990s and may seem a little dated to some readers, but the methods she used worked. The dog stayed until she died at 11 and when the the daughter was 11; the entire family was totally in love with the dog. Some of the techniques may seem a little extreme, but the article is written by someone who hated the idea of returning the dog to the adoption group. Greyhounds do not know what children are. To a greyhound, a child is another dog. 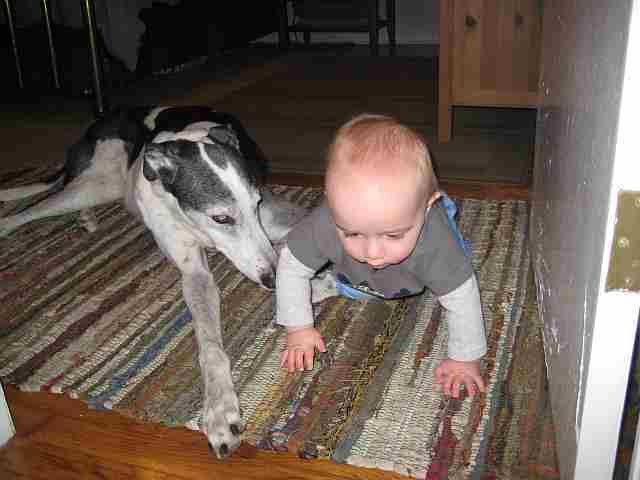 Therefore, it is important to properly introduce your greyhound to your children. Greyhounds are pack animals, like any other dog. Your greyhound needs to establish its place in the hierarchy of the household. First, the adults need to be top dogs. Then, the children need to assert their place on the second step on the hierarchy ladder. If there are other dogs already in the house, they will likely be on the third step of the ladder. Finally, the newcomer will be on the fourth step. But, each will eventually work out where it stands. The major task is establishing the children’s position in the hierarchy. Prior to the dog’s arrival, the children need to understand how to treat the dog and how the dog will act in certain situations. True, greyhounds are docile, laid back, obedient, and just generally wonderful. But given the right circumstance, they will act like any other dog and react in a way to protect themselves. 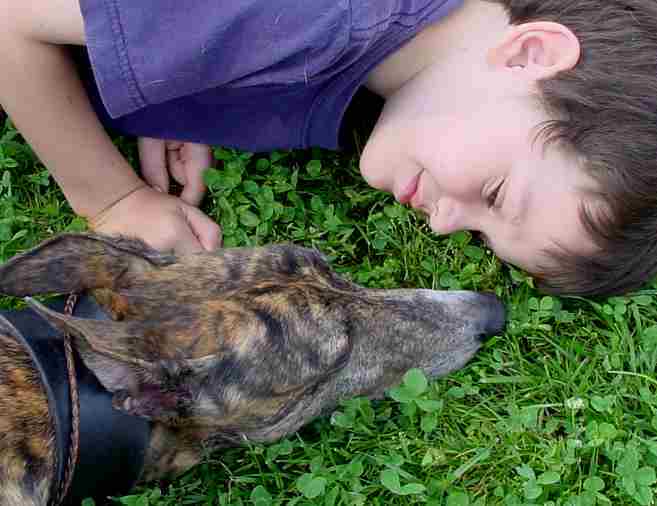 Children should be introduced to the greyhound outdoors. The yard is a good place since you want the house to be an extension of the crate. The child should enter the house first, showing the dog that the child is higher up on the hierarchy. The child MUST be given some duties to demonstrate its control over the dog. For example, the child can: give the dog treats when entering the house; give the dog its feed dish; learn to discipline the dog by telling it “No!” in an authoritative way; put a leash on the dog; let it out (in a fenced in yard, of course) to eliminate. Children may walk a greyhound. However, children walking a dog should not pick up speed. The greyhound will think “The race is on!” and may sprint, pulling the child who may not regain foothold until the race is over. Under a normal walking pace, the dog is easily handled by young children with adult supervision. Of utmost importance is that the child should give the dog space. This means the child should not crowd the dog, nor hug the dog tightly around the neck or crawl into its crate (especially while the dog is occupying the crate); not to disturb a sleeping dog. Remember: Greys often sleep with their eyes opened. So, if the eyes are open, the child should not assume that the dog is awake. 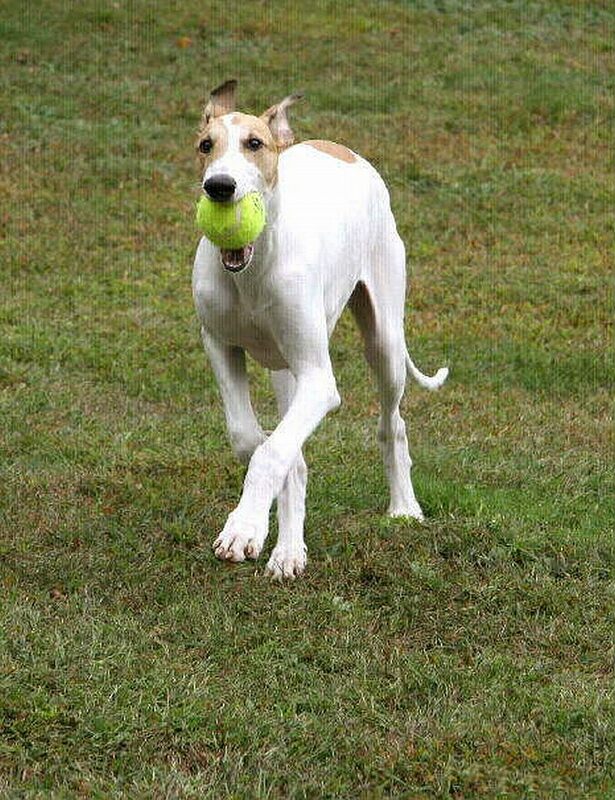 Some greyhounds love to play fetch with balls. Fun-loving Geoffrey Goldstein loves to play with many kinds of toys. Next, the child has to teach the dog to play. Greyhounds do not understand the concept of play. If your child starts to play with your new greyhound, the dog may think of it as aggression. 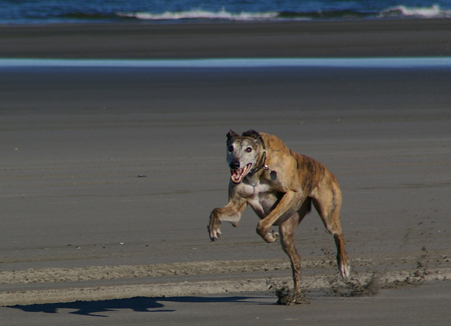 This is not to say that greyhounds will not ever play; most need to be taught how to play. What is good play? We’ll start with some poor kinds of play first. Most behaviorists say that the two worst forms of play for any dog are the Tugging and Wrestling Games. Tugging is terrible because of high incidence of biting while the dog is releasing and grabbing the tugged item. The small hand of the child may be mistaken for the actual item, resulting in an unintentional bite. Another problem with this game is that when the dog takes final possession of the item, it thinks it won over the child, and confuses the child’s place in the hierarchy. One more problem with this game is that it teaches the dog how strong its jaws are and how to be aggressive. Tugging games can easily be converted into fetching or retrieving by training the dog to release on command. Please don’t tease the dog by not giving the toy back to the animal after it has nicely given you the item! You will confuse the dog and will only have untaught it to give it up. Wrestling is never a winning game if your small child is on the bottom. Pinning a child puts the dog one up on the hierarchy and the child, one down. This, too, could result in an intentional bite because of the position of dominance that the dog has gained. Chewing is play for dogs. Chew toys are very useful because their teeth and gums will benefit from the stimulation of chewing. Be sure you teach your child not to disturb or remove an item from the dog’s mouth. Balls are good interactive toys for your dog and child. When choosing a ball, choose a large enough ball so it doesn’t get swallowed and hard enough one to survive chewing and grabbing. This is a good opportunity to teach the dog to give up the ball. This will reinforce submission and discourage tugging. Rudy Grieves shows his power. No one should be in his path, especially a youngster! This is a double-edged sword. In a confined area, running may be OK, but the dog can be injured because of obstacles, toys left in the yard, or children in the dog’s path. Running is best left for a large, fenced-in area with the children on the sidelines. Imagine a 45 mile an hour steamroller coming at a 35 pound child in its path. Do we need to say more? In general, use good, sound, safe judgment when teaching your child and your dog to get along. It is up to you to teach both how to interact and become friends. Proper introduction of your baby to your dog begins before the baby arrives. The sounds and smells of a new baby are all foreign to a dog. Bring powder, lotion, and any other related smells home before the baby is born. The dog will become familiar with them. Once the baby is born but before the baby comes home, someone should bring home a soiled diaper and a tape of the baby crying. You need to desensitize the dog to the sound of the crying baby because, to the dog, the cry of a baby sounds like a wounded small animal. There is always the chance that the dog will try to attack the wounded animal, not realizing the sound is your baby. The diaper containing the scent of your baby, unpleasant as it may be, will help prepare your dog for the baby’s arrival. When you bring the baby home, if there is any doubt about how your hounds will react, introduce the baby to your dog outside the home. The child should then be brought inside before the dog reenters the house. This will help establish the child’s higher step on the hierarchy ladder. Most dogs, however can be introduced on a leash while in the home. It is of the utmost importance that you show attention to the dog while the baby is awake and present so that the dog does not resent the child. While the child is sleeping the dog should be ignored. It is extremely important for the dog to associate the child with pleasure and not with competition for attention. As the child grows, this will not be so critical. But while the child is still a baby: NEVER, EVER, EVER LEAVE THE BABY ALONE WITH THE DOG! The baby’s crib or cradle must always be higher and out of the dog’s reach. When your baby starts crawling around, watch out for the child’s safety. The ultimate concern is that the dog, being much larger than the child, may pounce on the child to play, thinking it’s another dog or may nip it because the dog may think the child is entering its territory. Conversely, the child may hurt the dog by pulling the tail, the ears, startling it while it sleeps, or even pinching or biting the dog! As your child grows, keep teaching it to respect the dog as a living, feeling member of the family. Use common sense and hopefully all will be well. Whether or not you have children, it is wise to introduce your dog to children in a structured way. Teach the child to let the dog come to it and sniff it. Then, if everything goes well, the child may offer the back of the hand, keeping it in full view of the dog. Never, ever allow the child to reach over the dog’s head to pet it without going through the other steps. Strangling the dog with affection should be avoided. Dogs like their space just like people do. They get grouchy just like we do. Have you ever “snapped” at anybody because you’ve had your fill? Dogs do the same, even if they love you. Have you ever seen a child try to mount a dog as though it were a horse? Even though some greyhounds are quite large and tolerant, they are not miniature horses to be ridden and will not appreciate this attempt! It might be a good idea to introduce one or two children at a time to your dog, not five or six. Meeting a group of children can be scary for a dog, especially if they all come swooping down on it. You must calmly tell them not to crowd the dog. A group of children can easily surround a dog, leaving it no escape. Again, give the dog space. Our dogs love human attention but they need humane attention. ALL RIGHTS RESERVED This article and any photos or artwork contained within may not be reproduced or reprinted. Sabbah, this is no myth nor does this article state that every child or every greyhound will have a problem. Did you not see the photos showing otherwise? Having been involved with greyhound adoptions 30 years, I’ve seen plenty of greyhounds being returned because the 3 or 4 year old children didn’t know how to act around a fresh-off-the-track greyhound. Take off your rose-colored glasses and the chip on your shoulder. The techniques work *when they’re needed*. I don’t agree with every sentence in the article and neither will other thinking readers but the open-minded among us will take from it what they need. We *do* welcome constructive criticism so if you care to post again, be polite and constructive or you will be deleted.